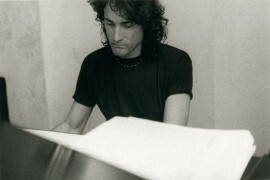 Chesky developed his own style of composition heralded as “Urban Orchestral” music merging classical techniques with sounds emanating from the streets of New York. This unique style has critics raving “Chesky fuses diverse influences into a musical language all his own.” (Gramophone Magazine). This style produced genre-bending works including his Rap Symphony, and concertos for electric guitar, violin, and cello, featured on 2011 albums Urbanicity and String Theory. Classics Today praised String Theory, “This music has integrity, and it gets under your skin.” His solo piano album The New York Rags, was cited by The Absolute Sound "as being one of the best piano albums ever recorded". Chesky’s ballets, including Hope, commissioned and toured by Alvin Ailey American Dance Theater, as well as his children’s ballet, The Zephyrtine, and The Central Park Dances, Urbanicity and The New York Variations; reflect modern life in a fast city. His distinctive sound has attracted numerous accolades, including the prestigious Lancaster Symphony composer award, where he has continued a partnership, performing his Concerto for Guitar and Orchestra, and Violin Concerto No. 3 “Klezmer” with them. Chesky received nominations from the Independent Music Awards in 2017 & 2018 for his recordings of The Venetian Concertos, and The Spanish Poems. His comedic adult opera, The Pig, the Farmer, and the Artist premiered at the prestigious New York Fringe Festival, leaving audiences in laughter-filled tears. Opera News praised that “Chesky could turn out to be a one-man Brecht-Weill for the twenty-first century. Internationally renowned, Chesky served as the Composer-in-Residence for the National Symphony of Taiwan, and brought Urban Orchestral style to the international stage with the world premiere of New York Variations in Taiwan. His children’s opera The Mice War has been performed in Poland at Teatr Muzyczny, and at The National Theater of Taiwan in Chinese to sold-out audiences. With such a positive response, the libretto has been translated into Polish, Italian and Portuguese, and the DVD received accolades at the Newport Beach Film Festival, Dallas Kid Film Festival, and the Madrid International Film Festival. Chesky is committed to fostering music education in young children, fully aware that our audiences tomorrow depend on introducing classical music to today’s youth. Consequently, Chesky created the album Classical Cats™, a fun, endearing story that gives children an introduction to the orchestra and classical music, awarded Dr. Toy’s Recognition of Excellence. The Mice War reached international acclaim as an opera and film, and his children’s ballet Zephyrtine was reviewed as “Intended for children but musically sophisticated…” (Fanfare Magazine). Chesky is also the author of The Snowbears of Lake Louise™, a book that educates children about the importance of preserving the environment. Miami native Chesky moved to New York in 1974 to officially begin his career as a musician. With an interest in both classical and jazz, he immediately began studying composition with Pulitzer Prize winner, David Del Tredici, and piano with John Lewis of the Modern Jazz Quartet. His blending of genres was first reflected in the culmination of his big band, The David Chesky Big Band, where he performed at every major jazz club and festival including; The Village Vanguard, Storyville, and the Newport, JVC and Monterey Jazz Festivals. Still active as a jazz pianist today, Chesky plays and composes for his new group, Jazz in the New Harmonic, incorporating 12-tone and contemporary classical harmonies into jazz, and his Grammy nominated Latin-jazz fusion, The Body Acoustic. During the 2017-2018 season, Chesky released recordings Piano Concertos No. 2 & 3, with Orchestra of the 21st Century. The album was immediately hailed as “…distinctive, catchy and brilliantly conceived…” by Fanfare Magazine. In New York, Brooklyn Academy of Music will premiere Chesky’s latest opera La Farrannucci with New Camerata Opera. Metro Chamber Orchestra presents Concerto for Guitar and Orchestra, with esteemed guitarist Angel Romero, and Rachel Barton Pine along with the Lancaster Symphony present Violin Concerto No. 3 “Klezmer”. Internationally, Chesky’s In Australia, Three Psalms for String Orchestra will have its Australian premiere with Musica da Camera String Orchestra, and The Mice War returns to Taiwan’s National Theater. Chesky’s The Spanish Poem, featuring soprano Maureen and McKay, is nominated for an Independent Music Award, after being released in early 2016. David is the founder of the audiophile label Chesky Records. Producing the highest quality of recordings available today, Chesky Records has produced over 500 albums with highly accomplished artists in genres spanning classical, jazz and world music. David is on the forefront of audio technology; having created the world's first 128x oversampled recordings, 96kHz/24bit recordings, and created the 6.0 multichannel 192kHz/24bit DVD-Audio Disc layout. In 2007, he opened HDtracks.com, the world’s premiere online download service that delivers high sound quality in AIFF, FLAC and 192kHz/24bit high-resolution files. Chesky currently resides in New York City with his wife, Brazilian actress Patricia Dinely and their two children; Paloma and Lucca.